Looks like you are currently in United States but have requested a page in the Burundi site. Would you like to change to the Burundi site? What happens when one of Germany’s most important writers, himself a Muslim, immerses himself in the world of Christian art? In this book, Navid Kermani is awestruck by a religion full of sacrifice and lamentation, love and wonder, the irrational and the unfathomable, the deeply human and the divine – a Christianity that today’s Christians rarely speak of so earnestly, boldly and enthusiastically. With the open-minded curiosity of a non-believer – or rather a believer in another faith – Kermani engages with Christian art in its great richness and diversity. The result is an enchanting reflection which reinvests in Christianity both its spectacular beauty and its terror. Kermani struggles with the cross, falls in love at the sight of Mary, experiences the Orthodox Mass and appreciates the greatness of St Francis. He teaches us to see the questions of our present-day lives in the pictures of old masters such as Botticelli, Caravaggio and Rembrandt – not with lectures on art history or theology, but with an intelligent eye for the essential details and the underlying relations to seemingly remote worlds, to literature and to mystical Islam. Kermani’s poetic school of seeing draws us in as we are carried along by his unique perspective on Christianity, rekindling our interest in great art at the same time. We are captivated by his unique and brilliant Islamic reading of the West. Navid Kermani is a writer and scholar who lives in Cologne, Germany. He has received numerous accolades for his literary and academic work, including the 2015 Peace Prize of the German Publishers’ Association, Germany’s most prestigious cultural award. "This truly is one of the best books I've read in years: funny, outrageous, touching, intimate, glorious." "Navid Kermani has written one of the funniest, most perceptive, outrageous and engaging books about art, life and faith that I have ever read… It’s wonderful. It’s cathartic. It's transformative." "An astonishing, deeply sympathetic, constantly surprising meditation on Christianity from one of the greatest Muslim writers and thinkers in the Western world. Kermani writes perceptively about individual works of art and particular places, about the New Testament, and about the rich traditions of Christian theology and practice. Still more important, he articulates a vision of Islamic–Christian friendship that is, in our vexed world, a human gift of rare importance." "In this beautifully written book, Navid Kermani performs something which, if not unprecedented, is still highly unusual, as he considers Christianity from the distance of a different faith. He does not claim any superiority here, quite the opposite. Unencumbered by the need to accept or reject, he explores the Christian faith with an alert interest and consuming curiosity. Through his keen gaze, coupled with a profound knowledge of theology and art history, Kermani captivates readers with the marvels of artworks that they might otherwise never really notice. The anglophone world needs and deserves this gem of a book." 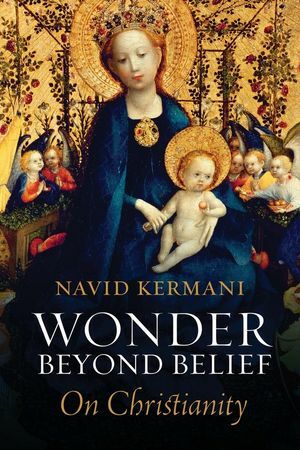 "In this book Navid Kermani draws on his unique perspectives as a Muslim intellectual to offer thoughtful reflections on the complex divine ideas underlying Christian art and the deep parallels that can be drawn between it and other traditions, including mystical Islam. As an outside observer of Christianity, Kermani reminds us that the great faith traditions have more in common than they have difference and how, at the end of the day, we all pay tribute to the same divine spirit. May more Muslim and Christian thinkers alike be inspired by his deep reflectiveness and willingness to engage across faith traditions." "When I lived in Deir Mar Musa, Paolo Dall’Oglio would sometimes press a “very important” book on me to read. I am sure that Wonder Beyond Belief is one of these books. It encourages debate and impresses the reader with the need for communication and respect for other people’s beliefs." "Superbly written with occasional suprises, this book is hard to put down"